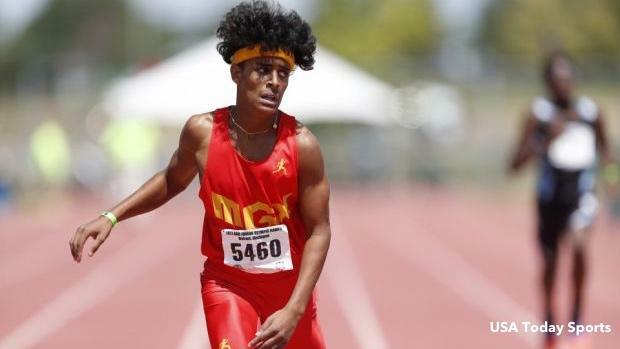 It's tempting to focus solely on the incredible individual performances of superstar athletes such as Tyrese Cooper and Cha'iel Johnson over the summer track and field season. The Florida natives have been dominating their competition and producing stellar results almost on a weekly basis, one after the other. We as fans tend to view youth track and field through a prism of future development, and Cooper and Johnson are perfect muses for that sort of projection as they continue to run times generally produced by much older and experienced athletes. We see their marks and dream of how good they can be one day when--or if--these prodigies rise to the highest level of the sport. But even if that urge to contextualize every result is difficult to resist, doing so at any big competition is missing the forest within the trees. And the forest in this metaphor is Miami Gardens Xpress (MGX)--the club team of Cooper and Johnson. This past weekend, MGX became the second program in AAU Club Championship history to win both the boys and girls competitions. The boys scored 323.50 points, while the girls accumulated 187--back in 2014, Track Houston became the first club to double, scoring a total of 590.5 points at the AAU Club Championships. "I think everybody has a line," said MGX coach Darius Lawshea, who's coached the program since 2008. "My line was this: I was a little guy who had to work harder than everybody. I didn't have the physical ability. But what I did have was hard work. So I tell all my kids, whether they have talent or God given gifts, 'Hard work gets you somewhere.' They can take that with them. Hard work will always get you where you want to go in life. Period." Over two decades ago, Lawshea practiced what he preaches today. As a prep at Miami Norland High School in the late 90s, he was about 5-foot-5 and 120 pounds. He ran 400 meters in 47.9 seconds and 800 meters in 1:59. His squad in the 4x400 qualified for state, he said, and he remembers of that period, "We were bunch of little guys running against skyscrapers." Lawshea didn't originally want to headline a youth track program. He simply wanted to train athletes. After his ex-wive moved away from Florida with his son--he had shown great promise in track, just like his father--Lawshea vowed to get involved again. "I felt like I needed to do something," Lawshea said. "In order to keep level-headed and keep me going forward, I wanted to contribute to track and field. I stayed with it." He joined the North Dade Track and Field Club in 2007 and helped train its athlete. Then a year later, when the head coach of the program decided to step down, he asked Lawshea to take over. At that point, Lawshea remembers, Miami Gardens was a burgeoning city. "The area became a city, so I wanted to name it in honor of that," he said. Lawshea decided to rename the club. Miami Gardens Xpress was born. Fast forward 10 years later, and MGX is a full bloom powerhouse. They had close to 170 athletes from ages 6 to 18 compete for the club this summer. Fifty-seven athletes went to AAU Club Nationals. Another 30 are going to go to Des Moines, Iowa, for the AAU Junior Olympics. "Originally, I just wanted to be an influence, I just wanted to train," Lawshea said. "But now I coach one of the top programs in the country. I never saw it coming, but it was my calling." At the AAU Club Championships, for example, the meet was not just for highlighting individual success but for exploring which national-level squad put together the most depth from top-to-bottom. In 2017, MGX won the event by a gigantic 267.50-point margin, the largest margin by a champion dating back to at least 2010--no other team score results are available online. If last year's dominant win at AAU Club Nationals--their second-ever title--was their big breakthrough after finishing second the previous three years, then 2018 only amplified that feeling. MGX followed through with that promise, winning the Club Championships with 510 points among 307 competing teams. "We not just a running club anymore," Lawshea said. "We're a multi-club. The only event we don't do now is the steeplechase. But we had our first pole vault champion this year. We have race walkers. We have multi-event champs. We had a javelin thrower." Lawshea has another coach, Alphonso Gammons, who works with his younger athletes. He has another coach who works with multis and other events. Lawshea works with ages 9 and up. "Once we figure out the steeple, we'll be the most diverse program in the country, and we don't even have a track," he said. "We've grown a lot for a program that practices on grass." That's true. MGX practices adjacent to Miami Norland Middle School, just a skip away from where Lawshea grew up and went to school. 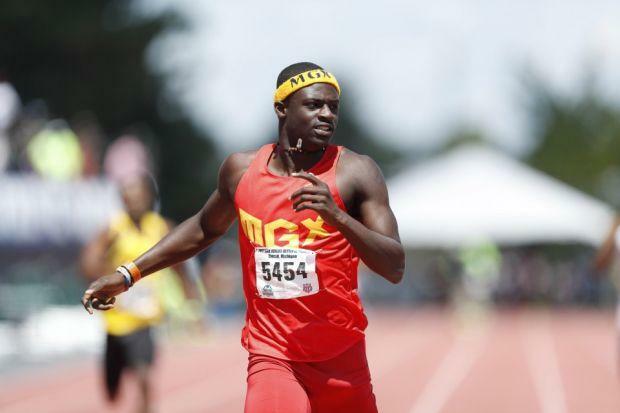 But now Miami Gardens Xpress appears ready to take control of the youth track and field world after previously producing five straight years of top two finishes, a feat unmatched during that time frame. No squad but MGX appears more than once in the top two over the last five years, a testament to how difficult it is to maintain performance and turnout for a youth club track team. Credit here goes to Lawshea, who has grown the MGX team to nearly 300 members in just the decade he has coached the program. Cooper, a high school senior-to-be, will soon exit the youth ranks and take his otherworldly talent with him, but it's safe to assume that his club team will thrive even without him. 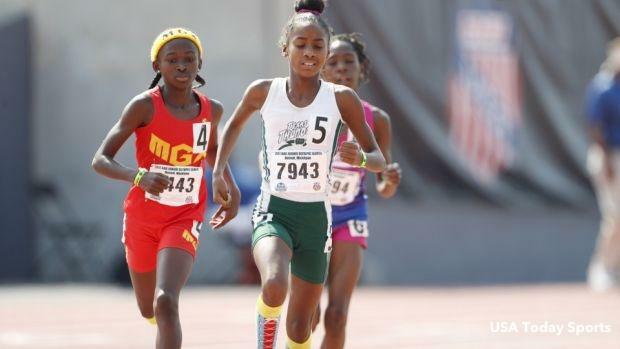 Sure, you could point to the fact that MGX had more entries than any other team at AAU Club Nationals this year, but even so, this version of the Miami Gardens team is perhaps more balanced than any other in history. For years, MGX's finish at AAU Club Nationals has been carried by strong performances on the boys side, but 2018 saw a much bigger presence of female MGX runners occupying top spots on the podium than in years past. Heading into the last day, MGX had the highest point total on both the male and female sides, which ultimately became an incredibly rare accomplishment. No team since 2012 topped the male and female point totals, but with plenty of stars to shine tomorrow, Lawshea's group bucked the trend. Track and field can often feel like an individual sport focused on times and a few major events, but a meet like the AAU Club Nationals really reinforces that athletics is, in its purest form, a team pursuit. "My thing is promoting track and field," he said. "We don't have just football and basketball here. I believe when we do this, we do it for the kids who love track and field. I do it because I want to get people talking about track in they they talk about football. I think we can make that happen." Records and medals are nice, but in a sport that's constantly playing catch up with football, basketball, and baseball in the U.S., it's great to see a youth program develop and sustain team success. 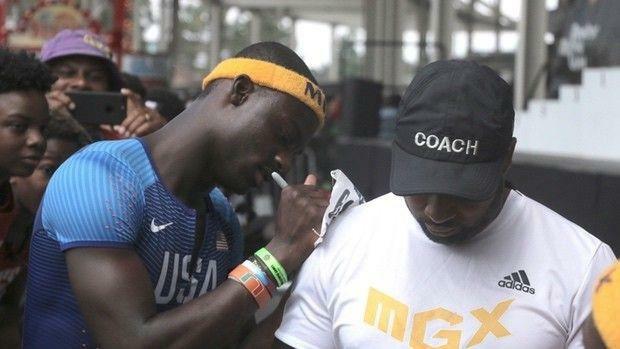 Being a part of something bigger than yourself is one of the most compelling things about athletics, and despite having a stable of young superstars, MGX's growing reputation as a track and field dynasty exceeds any one individual that has helped them reach this point. That's the mark of a team with staying power, and one that is doing more for youth track and field in America right now than any other club. MileSplit producer Cory Mull contributed to this story.